Katie McGarry is quickly becoming one of my favorite authors, and Crash Into You cements her status as an author whose books are not to be missed. This kind of writing is why I love contemporary YA! Crash Into You is just as good as its predecessors in the Pushing the Limits series. It's my second favorite book in the series, after Pushing the Limits. I love how each book focuses on two characters, and the fact that previous characters have little cameos in subsequent novels. I love getting a glimpse of favorite characters living out their happily ever afters. I also love that there is plenty of closure between books in this series. I find myself happily anticipating the next release, but I'm not torn up with a cliffhanger ending between installments. McGarry's writing draws the reader in and her books are nearly impossible to put down. Even when I may not particularly like a character or agree with their behavior, I still care about them. This is a trademark of a great author: compelling the reader to care about characters by delving so deep into their psyches that the reader completely understands why the characters act the way they do. I never thought I'd be interested in street racing, but I found myself really enjoying that aspect of the story. I also really enjoyed the development of Rachel's home life and her interactions with her brothers. I liked that Rachel finally stands up for herself and effects positive change within her family. McGarry's books always have a great amount of character growth and I love that. 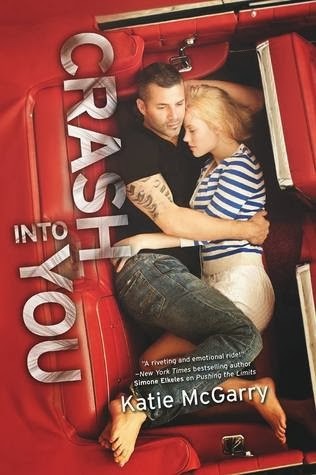 Crash Into You is excellent contemporary fiction and a perfect example of why I love this genre. I can't wait for McGarry's next release!